So, yeah, I’m still not over this flu thing. In terms of energy, I am pretty much wiped. My week hasn’t so much peaked as barely managed to muddle along…. so let me tell you about something a wee bit different. This month, in between the physio appointment, the flu, stage three of the Great Round of Mandala, spiraling hoop dance and dreams of spinning mandalas, I took part in a beta programme. 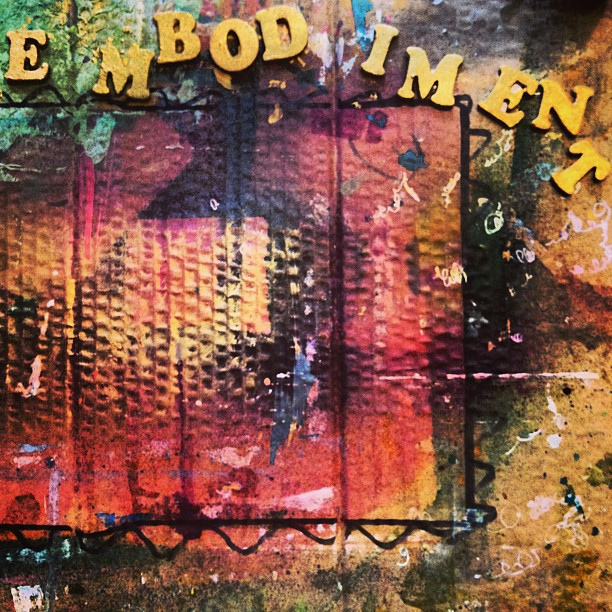 Lindsay McLeod (aka GuruBody) has just introduced a new programme for artists that you will love called the Art of Embodiment sessions. I experienced a session with Lindsay a couple of weeks ago, so I know you’ll love it. Over Skype video, you get to spend a whole hour within your body and with Lindsay’s expert guidance, discover what messages it has for you. If you allow it, healing will also occur. Soulful self discovery is deep work, but most of it takes place in the head, or on the page. Like so many others, I often fail to slow down and listen, really listen, to the wisdom of my body until it screams at me in utter discomfort. My Art of Embodiment session with Lindsay meant I dedicated a whole hour to tuning into my body to explore my ever growing list of symptoms that stem from poor posture and a stiff back. Common symptoms, sure, but surprisingly debilitating. Lindsay’s expert guidance around this, quite frankly marvelous, arrangement of energies I call my body gave me some immediate insight into my current issues. The advantages of working with her over Skype meant that I was able to do so in the comfort of my own home, where I feel most safe and I know that meant I was more free and able to go deeper than if we were elsewhere. I’ve also been working with a physiotherapist to help ease my symptoms and the Art of Embodiment session taught me how I could visualise my inner workings in a way that made sense to me. It complemented the work I’ve been doing with the physio and helped me personalise it to suit me better. Working over video, Lindsay was able to identify a couple of areas that I simply wasn’t aware of. That feedback alone had the most enormous impact on me and I’m continuing to work with it on a daily basis, where I’m definitely seeing significant relief. I highly recommend all artists and lightworkers enjoy an Art of Embodiment session – it is a true gift to your soul self.